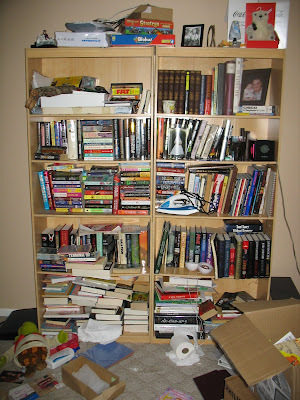 So remember last week when I tackled the kids books shelves? Well this week it's not the kids' mess I'm cleaning up. It's the office. Unfortunately, Ant's favorite activity lately is throwing things on the floor. It could be books, toys, all the cushions from the couch, it really doesn't seem to matter. He's definitely helped with the mess going on in the office. 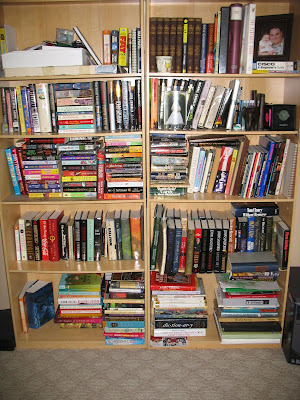 I know the shelves are still a little cluttery, but we need about 3 more book shelves before we can take stuff off these shelves. Jeff and I are both readers, and while I tend to recycle stuff on Paperbackswap.com, there are ones I keep to reread. And Jeff likes to keep most of his books. So without further ado, here's the before and after shots. Wow! Nice work on those book! Thanks for visiting my blog! Have a great Tuesday! I am tackling my desk today, have yet to post before or after pics, but I will when my usb is found! Haha! It's funny seeing "Watchmen" in between that series/collection you got on the first shelf (right hand side). I can't tell if that collection is encyclopedias or something else. Can you come over to my house for your next Tackle it Tuesday?